The original meaning of the Arabic word ghafr is veilingand concealing; maghfira is the veiling and forgiveness of allof our sins with Allah’s Favours and Mercy along with His overwhelmingEndowment of repentance. Allah reveals the exquisite and concealsthe ignominious in this world then He overlooks them in the hereafter. First, Allah veils and conceals the internal ugliness ofthe human being’s body and He adorns this body with an exquisite outwardappearance. Second, Allah veils man’s ignominious ideas and thoughtsand hides them in his heart so that no one can ever know them. Third, He veils the sinners’ sins though He possesses the perfect and absolute power to reveal the impact or the effects of these sins on the body or the face. Fourth, He veils and conceals the committed sins, and so will be the case on Doomsday, and He does not let anybody know them; furthermore, He faces the believer with his sins without the knowledge of anybody then He changes the evil deeds into righteous ones and blots the sins out of his Book of Reckoning and makes the believer’s organs along with His angels forget all the committed sins. 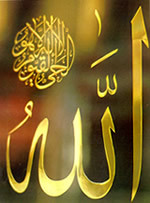 Glory be to the FORGIVER, Praise and Glory be to Him, He is Allah.